Sign up Now! Open a Sportsbook.com Betting Account! One of the biggest online sportsbooks out there, Sportsbook.com has had its share of ups and downs in the past few years but with a renewed commitment to the player experience and the ability to try out many of their offerings risk-free, Sportsbook.com has a huge community of online sports betting fans. If you’re looking for a consistent sports gaming experience, you would do a lot worse than Sportsbook.com. Licensed in the Kahnawake Gaming Community in Quebec, Canada, Sportsbook.com thus enjoys a certain level of credibility compared to some of the “flight by night” operations out there. With the best name in the business, you expect a certain level of service and perks – and Sportsbook.com does not disappoint. 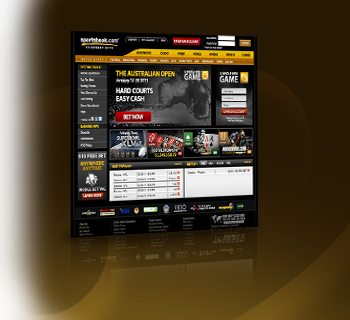 With a name like Sportsbook.com you had better hope that they would be a full service sportsbook – and you’ll be more than happy to know that Sportsbook.com delivers on its promise of offering “a whole new game”. The betting interface is quick and easy, while the Live Chat is lightning fast, helpful and most importantly knowledgeable in all issues we put to them. Sportsbook.com offers a full range of online gaming bonuses and promotions, however much of what is offered depends entirely on your deposit method and what you want to play. For sportsbook gamers, you can get a 10% bonus on your first deposit up to $650 free. If you make that initial deposit using Neteller, ECOcard or MoneyBookers howver the initial bonus balloons to a 25% bonus up to $1,000 free. Reload bonuses are only available for the casino and poker room. Nothing surprising here, Sportsbook.com does well when it comes to the lines and options available to bet on. While their betting interface is nothing to write home about, it is reliable and has no major drawbacks. Their list of Future, Exact and If bets listed are to die for, as are their list of Cross-Sport prop bets. Ther terminology is not for the brand new player, but they do feature a wide Handicapping help section and Betting tips. In years past this was an area of concern (to say the least), however it seems a commitment to changing their ways has paid off in spades. Customer Service has changed almost overnight, with friendly staff and a fast response time being the order of the day. You will still find complaints from time to time, however any time a site makes efforts to improve they’ll earn a passing grade from us. Despite the lack of available options for payout (currently only E-Wallet, Wire Transfer and Check/Gift Card are offered) Sportsbook.com does earn marks for giving members one free Payout per month. Members requesting payout via E-Wallet can expect their money within 72 hours (although many instances of delays are commonplace), but choosing Wire Transfer or Gift Card may leave you waiting up to 3 weeks to get your money. Sportsbook.com offers Live Betting on most major American sporting events however don’t expect the Red Carpet treatment; their Live Betting offerings are hidden within the Sportsbook itself and there is no published schedule, so bring a pen and paper. We would also liked to have seen a live update as events go on so you know how much time you have left to get in on the action. Get a 50% Bonus on your 1st deposit at Sportsbook! Open a Sportsbook betting account now!